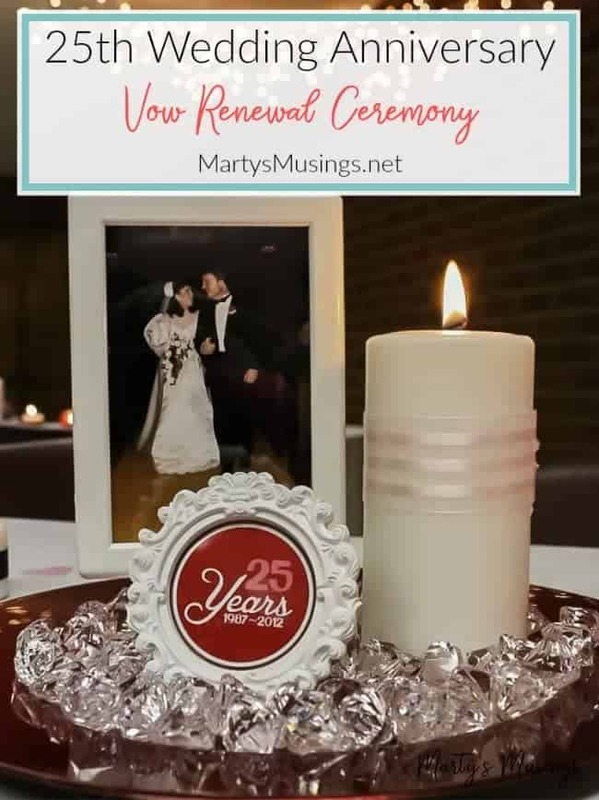 These 25th anniversary decorations are perfect for an an easy and inexpensive vow renewal service celebrating 25 years of marriage together! Marriage is hard. Can I get an amen? Those words are probably the most understated ones I could use to describe the journey my husband and I have taken over the last couple of years. As I recently told our youngest daughter, her dad and I committed our lives to each other and to God when we married so many years ago. Regardless of the tests these past two years have presented, neither one of us walked away from that commitment and the faith that binds our family together. 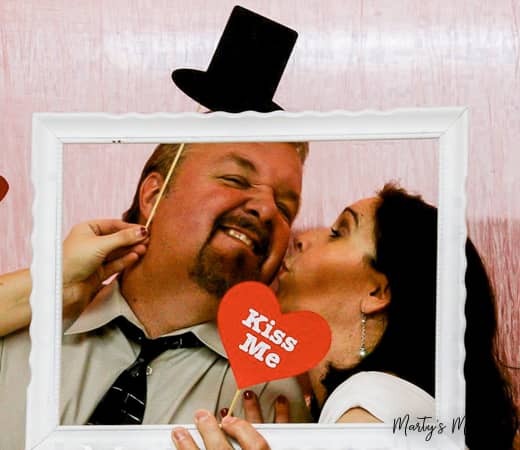 When my husband Tim and I got married we chose Valentine’s Day for the special occasion. He always said it was so he wouldn’t forget our anniversary! 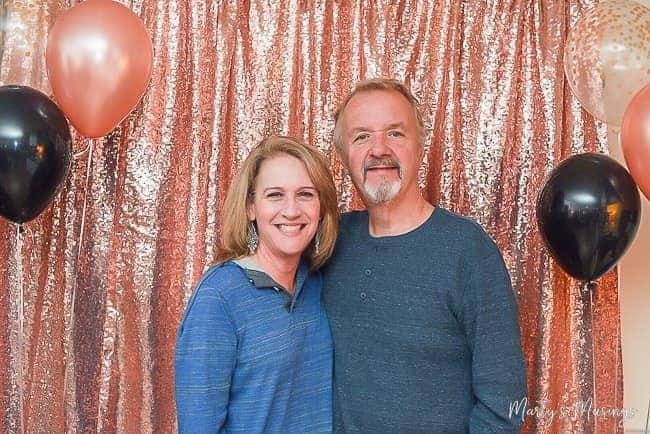 Even though we celebrate 32 years of marriage this year, our 25th anniversary will always stand out to me as the perfect one! 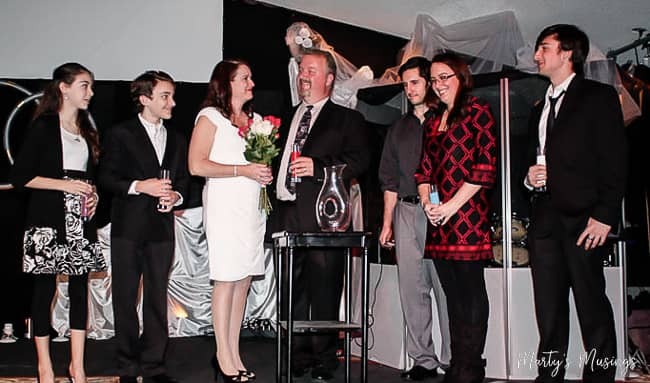 My husband, oldest daughter and niece pulled off a surprise vow renewal service for me, and it was the shock of my life! I hope you’ll enjoy reminiscing with me plus I’ve got great tips for celebrating a silver anniversary (or any special party!) These pictures of my long dark hair should also give you a few laughs. My husband and I sure have changed in seven years! 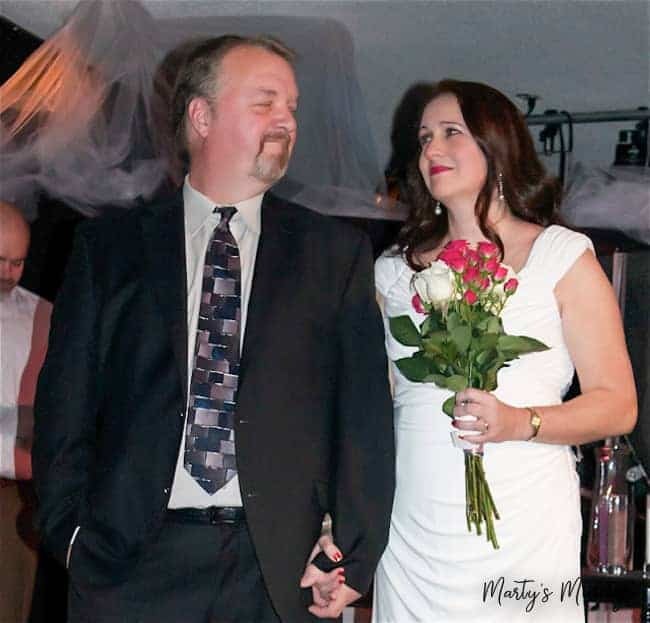 For our 25th wedding anniversary “date,” all I knew was that my husband was dressed in a suit and we were going to dinner at 4:30 Friday afternoon. After a delightful Italian dinner I was blindfolded and told since I had “trust issues” I needed to just relax and enjoy the ride. No questions, no lookey see. My mind raced as I pondered what he had in mind. Our old favorite bed and breakfast in the woods? A Broadway show in town or a concert? A night in a hotel? After 45 minutes of suspense we slowed down on a gravel road. I found out later my actor husband was just pretending as he said, “reservation for Walden. This wasn’t supposed to happen.” He’s such a funny man. Totally trying to throw me off. We arrived (at our daughter’s church) and he led me inside (to the worship center). He took off my blindfold and in the dark before me were candles in mason jars, lining the aisle of a darkened church. My daughter had bought a beautiful white dress for me and a bouquet of fresh white roses. Tim had written the entire ceremony and had my vows printed out (in large type, ’cause I can’t see anything with my contacts!) for me to read and approve or change. Knowing how hard I am to surprise, my family went to extreme measures to create the perfect evening. My oldest two sang “I Will be Here,” by Steven Curtis Chapman, a song Tim and I had often sung at other people’s weddings. 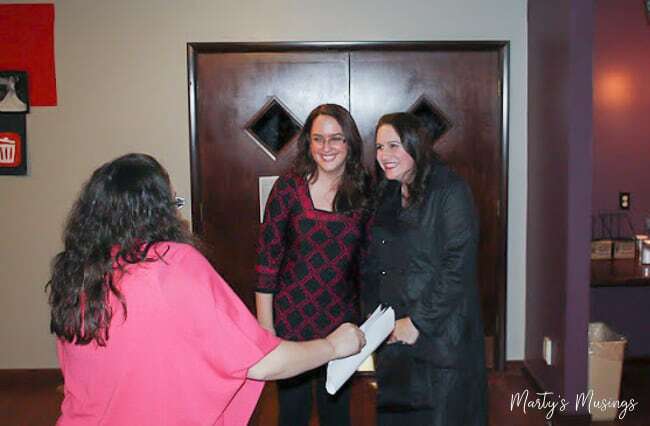 It was amazingly touching to see my grown children use their talents to bless their mom and dad. One of my favorite parts of the ceremony was the unity sand. There were five different colors of sand in glass cylinders, to be poured into one container, symbolizing our individual lives joined together as one. Not just a husband and wife but our children celebrating our union. Even though they were limited to the basement of my daughter’s church they did a great job transforming it into a beautiful celebration. 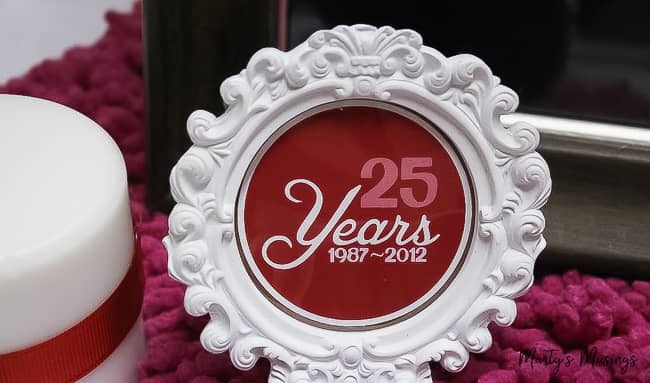 Here are a few tips for your own 25th anniversary decorations. 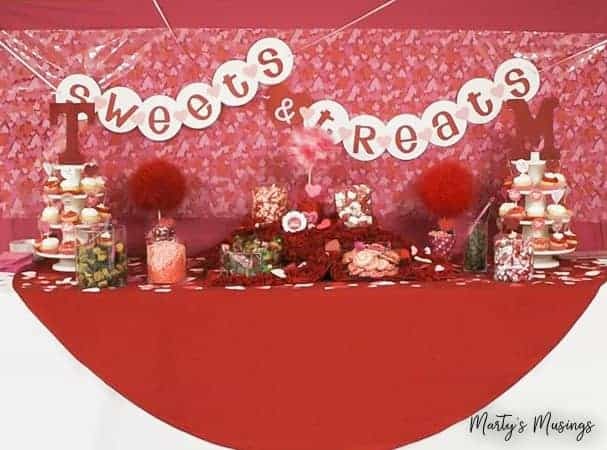 Decorations centered on the colors of Valentine’s Day: red, white and pink. Decorating a church poses its own problems, but I love the way my niece used a sheet and tablecloth to keep the focus on the beautiful food. Cupcakes were homemade with simple toppers made from scrapbook paper. Paper hearts were scattered across all the tables as well for a festive look. The unity sand was used as a centerpiece (and conversation starter) for one of the tables, as well as my roses for the “bride’s” table. Unbelievably, my husband smuggled out our wedding album so the decorations could include pictures from our wedding. 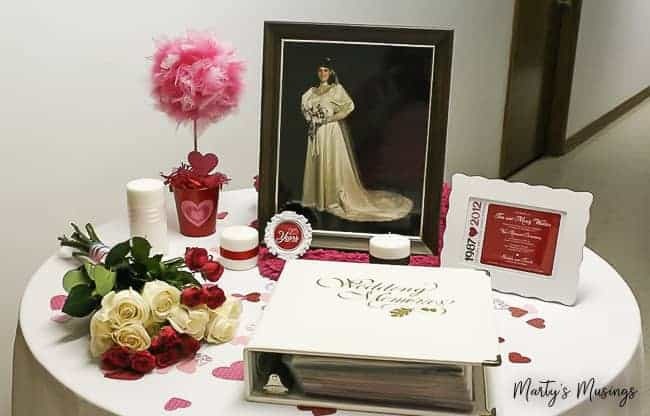 The “bride’s” table held the wedding album I made for our 15th anniversary. I don’t have a lot of time for scrapbooking these days, but I still treasure the memories recorded of our special day. The flowers are the bouquet my daughter bought for me to carry during the ceremony. And, of course, my bridal portrait was on display! 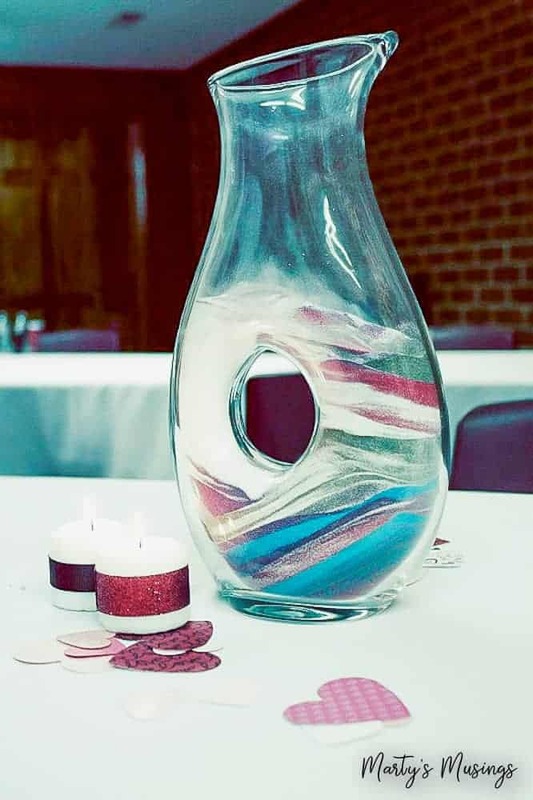 Candles are always an inexpensive and beautiful way to dress up any party or event. Wrap some glass jars in yarn or a white dollar store candle with ribbon. So simple! 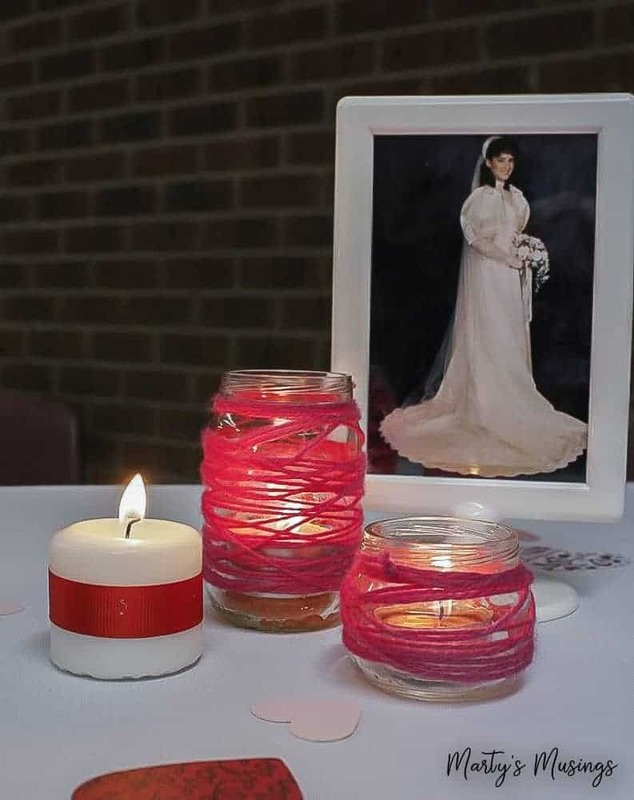 Arrange a candle with graphic from the invitation in a pretty frame and you have a lovely centerpiece! 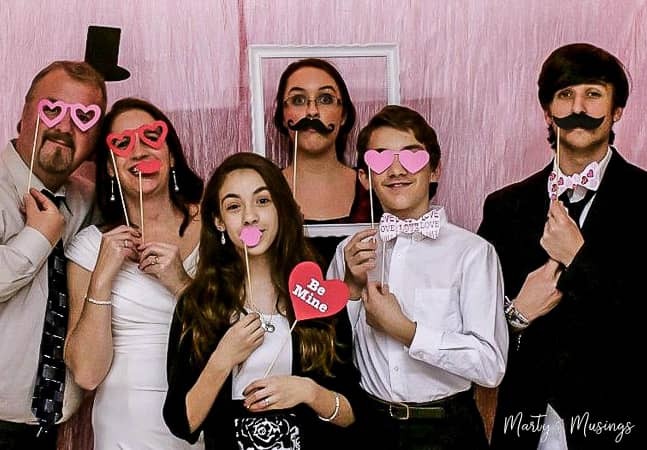 We had such fun with the photo booth and props and encouraged the guests to take pictures as well. 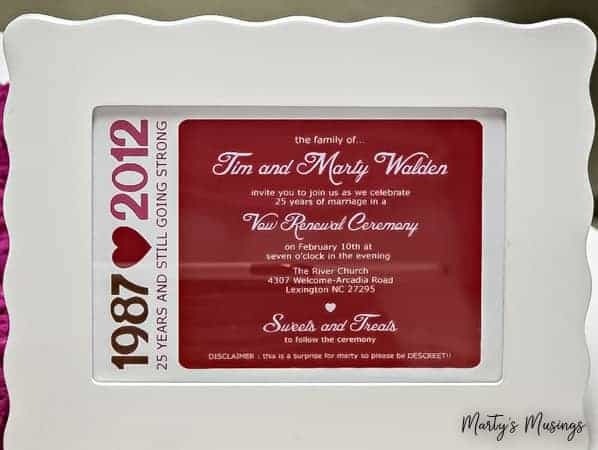 Fun ideas for 25th wedding anniversary decorations or adapt them for any celebration! To the man I married on Valentine’s Day almost 32 years ago, I cherish this life we’ve built together. The work we’ve done in these last months to restore and rebuild what the devil meant to destroy have become a shining example for our children. Nothing worth having comes without tears and perseverance. You are God’s treasure and mine. 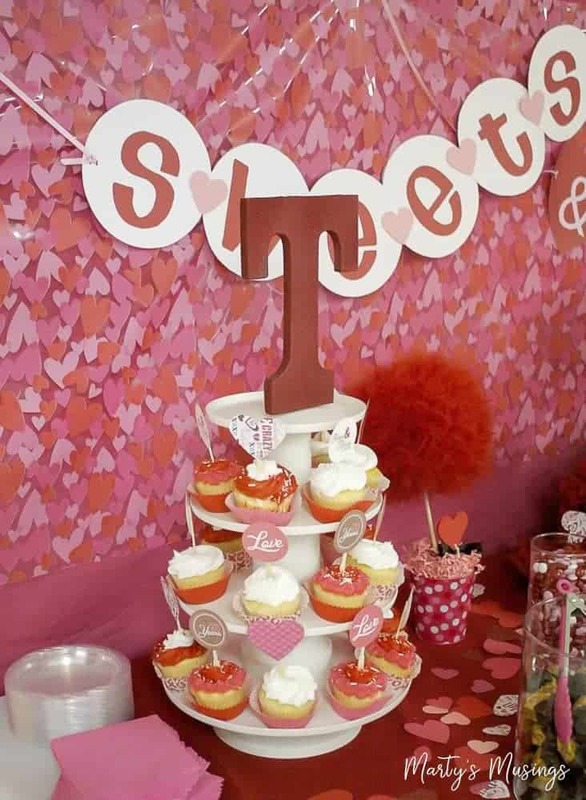 Read about my other Valentine’s Day decorating ideas with my DIY Valentine’s Day Banner, 7 Tips for Cheap and Easy Valentine’s Day Decorations and Easy Handmade Valentine Cards. This is such a great party! New follower from the Tip Junkie Link Up! I have a Sunday linky party too if you wand to share anything. Wow, the girls did a great job!! Happy Anniversary. A truly wonderful milestone! So sweet! 🙂 Everything looks beautiful my friend! Every thing looks so pretty! You did a great job. Happy Anniversary. Thanks for sharing with us at Link It Up Thursday. How sweet they are! They did a fabulous job!! Awwww.. That is so sweet! Happy Anniversary. What a nice, well thought out surprise.. Love the colors and the theme..
Everything is lovely! Visiting from CSI. Everything is so cute! I especially love the frames! Wow, that was so nice of them to create such a nice reception for your anniversary! They did a wonderful job! Just beautiful and what a love thing to do…renew your vows, I would love to do that again! So awesome! New follower from the bloghop! what a sweet and momentous time for you! you’ve made some beautiful decor! I love it, they did a fabulous job with the party! Thanks for sharing at The Fun In Functional! HAPPY 25th!!! LOVE everything!!! It looked so perfect! These all look great! I am a follower of your blog on Facebook and would love if you could hop over to my new blog (http://sarahsaturdiy.blogspot.com/) and share the blog love. Have a great weekend! I’m stopping in from Friday Chaos! I am one of the co-hosts and I’m so glad you linked up! Happy Anniversary! Your celebration looked awesome! I hope you’re having an awesome Friday! Absolutely love this! You did a wonderful job! I’m trying to get 100 followers before the end of the month, hope you decide to join me too! Thank you! It was such an amazing occasion! Congratulations! The decorations are great! !